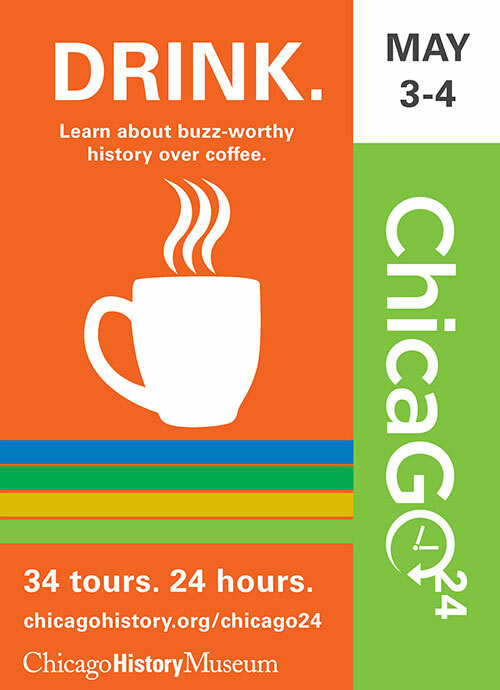 An annual series of back-to-back city tours for 24 hours straight hosted by the Chicago History Museum. Assisted with copywriting, editing, information architecture, prototyping, usability testing, visual design, web development, in addition to email marketing and managing the social media campaign. Why build a microsite? 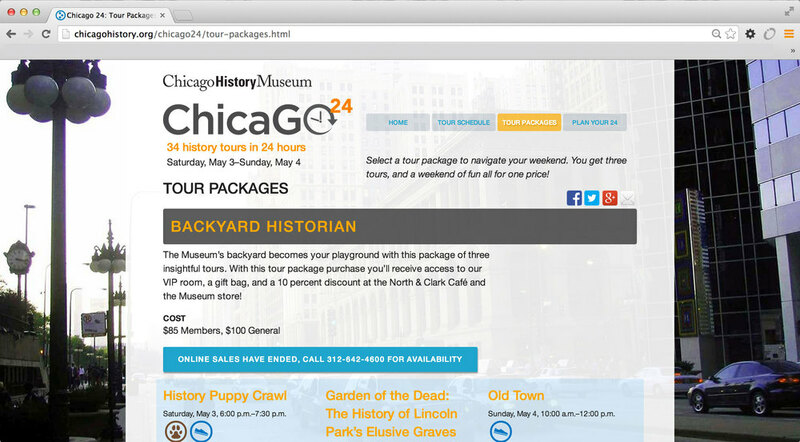 The current museum website is outdated, not mobile-friendly, and cannot handle listing Chicago 24's complex tour schedule. We needed to gain a complete understanding of the event in order to most effectively create a microsite that would fulfill the business goals of the Museum, and fulfill the needs of our main users (those trying to learn more about the event and purchase tickets). Resolving friction points including pricing, sponsorship, etc. After a series of informational meetings, we synthesized and outlined our findings in a creative brief. The website experience should provide a feeling similar to a music festival, where the city is the venue. There is no central hub/meeting place for all tours. We need to communicate logistics clearly, manage expectations, and possibly include a map(s). Avoid reading fatigue by keeping copy concise and skimmable. Clarify event details without losing personality. Ready. Set. Chica–GO! Mark your calendars. Synchronize your watches. CHM is taking over Chicago during the first weekend in May. 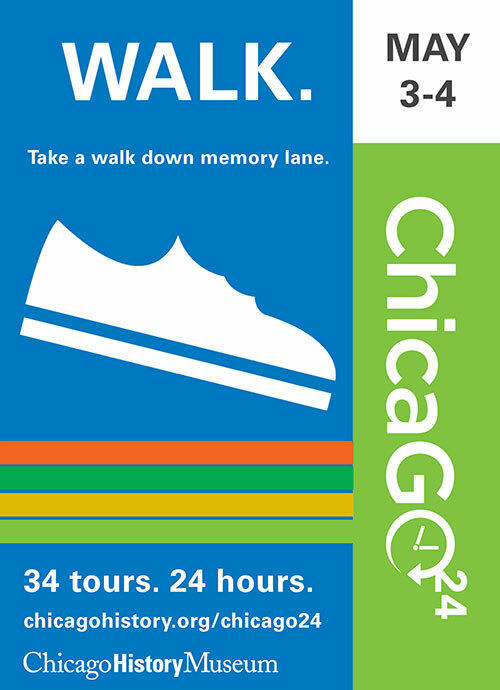 Join us as we explore the city by bus, L, foot, bike, trolley, and more—all in just 24 hours. Whether you’re a history buff, health nut, or insomniac—we’ve got you covered! 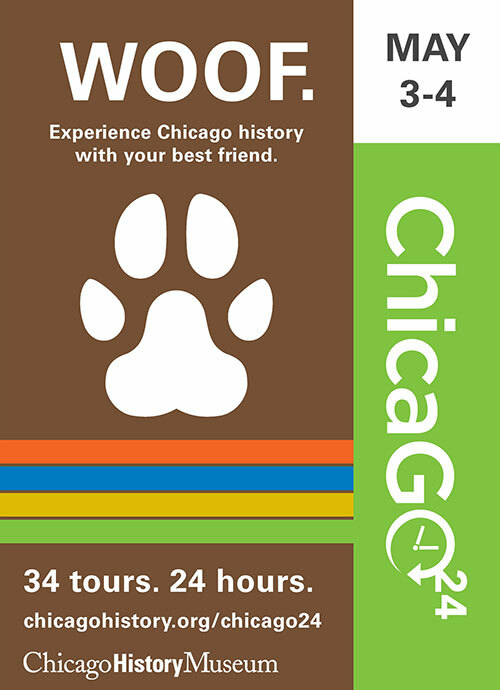 Saturday, May 3—Sunday, May 4, 12:00 p.m.–12:00 p.m.
34 history tours of Chicago taking place in 24 hours. Whether you’re a history buff, health nut, or night owl—we have a tour for you. Purchase your tour tickets and explore the city with us! Do you count your steps? Do you find yourself taking the stairs instead of the elevator? Are you looking to mix up your weekend workout? Then you are a History Health Nut. Warm up to history with this package of invigorating tours! Mix up your weekend workout while experiencing your city's history with this package of three invigorating tours. We know that Chicago is literally “wonder full,” but for the city’s 7 Wonders, what makes the cut? From our famous Chicago hot dogs (ketchup-less, of course), to our fantastic Blues scene, to the stunning lakefront, this is your chance to choose the wonders that best represent your city with public historian Josh Eisenberg. Chicago is full of wonders, from our famous hot dogs to our fantastic blues scene. On this tour, choose your own adventure and pick which city wonders you'd like to explore with public historian Josh Eisenberg. 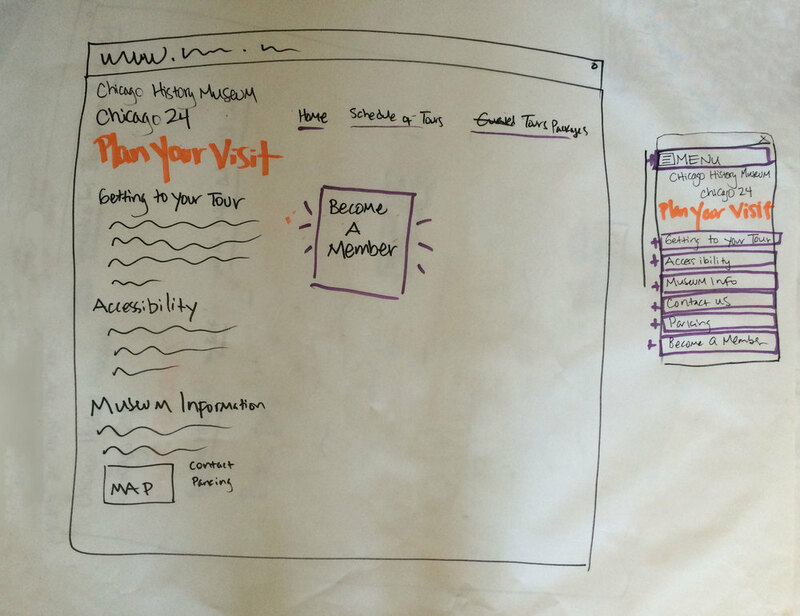 ...and from it, the first renditions of site organization, navigation, and interaction were created. 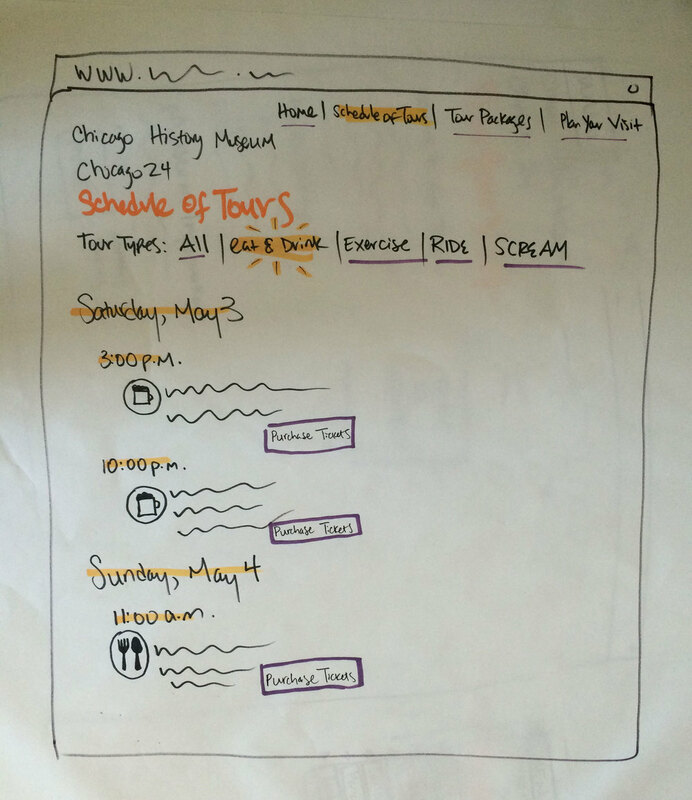 From this point, lo-fi wireframes were sketched, illustrating potential layouts for both desktop and mobile views. 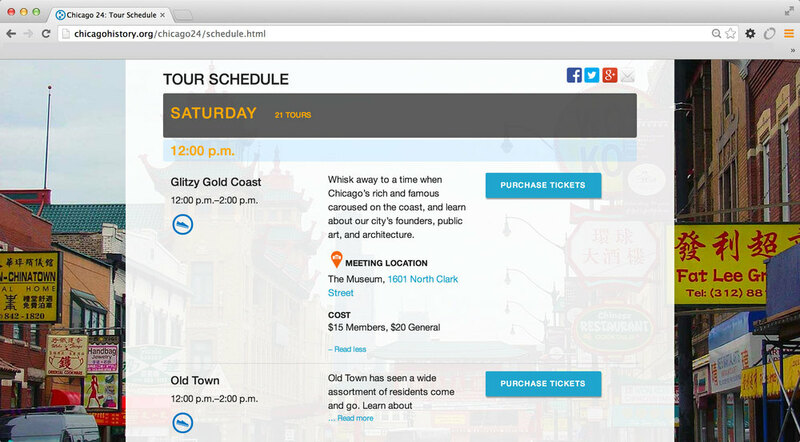 Interactions were illustrated as well to show how a user could filter the tour schedule by interest or activity-type, and could expand tour descriptions to read details. Due to limited resources, staff, and time, we jumped straight from lo-fi wireframes to a working hi-fi prototype. We felt it necessary to prototype the site structure and potential interactions as soon as possible in order to begin usability testing. We wanted to know if the website's tour schedule, language, and navigation structure made the most sense to our users, and would provide them with the ability to quickly and easily make a decision to purchase tickets to tours. The usability tests conducted were quick low-cost hallway tests. They included members of the Museum staff (Users A & B) who were unfamiliar with both the Chicago 24 event and our online ticketing process, but were within the target audience we were trying to reach. One test user (User C) was the online ticketing system administrator, who we had review the site. Though she had expert knowledge of the ticketing system, she did not have any knowledge about the website we were building. Find and purchase a ticket to a specific tour. Find and purchase a ticket to another tour. 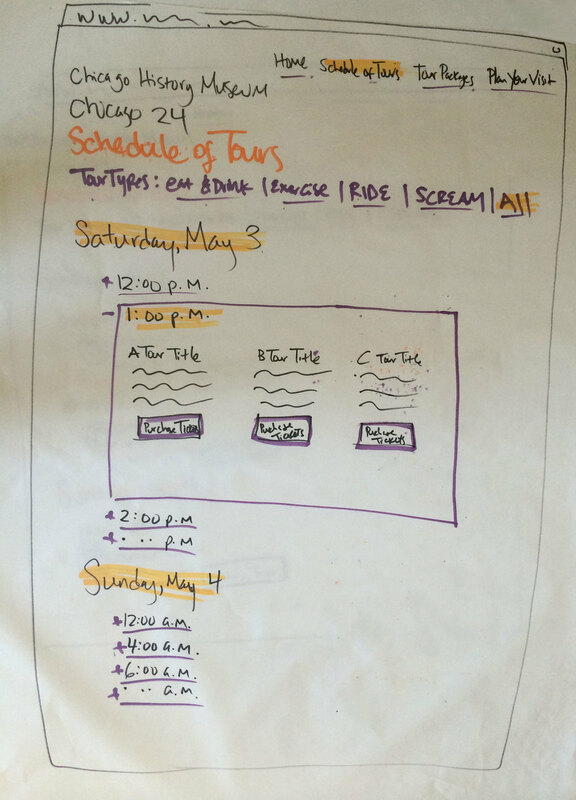 Review the tour schedule structure. Review the information for accuracy. Social media was one of the main ways we engaged with our audience to promote this event. 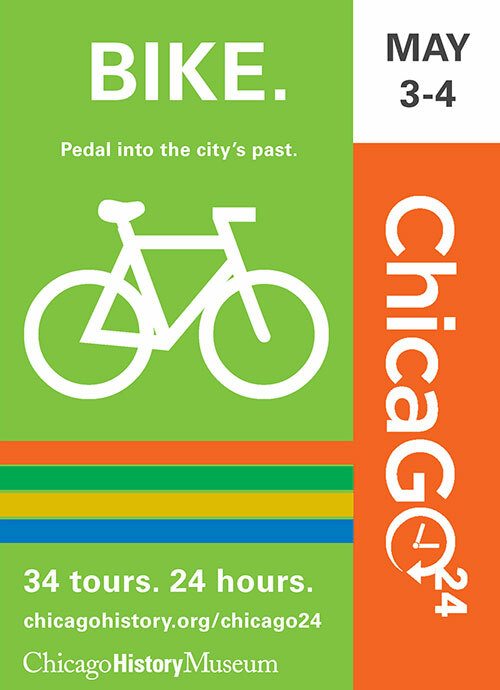 In addition to creating a branded poster campaign that illustrated the different actions each tour featured, we also ran a sweepstakes, encouraging people to retweet us in order to receive a chance to win tickets to one of the Chicago 24 tours. We sold 402 tickets total, earning us $10,000. We broke even, which was right on the mark, as this was the first year hosting Chicago 24 to establish it as an annual branded event. Based on a follow-up survey, 40% of Chicago 24 attendees were brand new customers who had never gone on a Chicago History Museum city tour before. Promote city tours, which the Museum puts on regularly year-round. 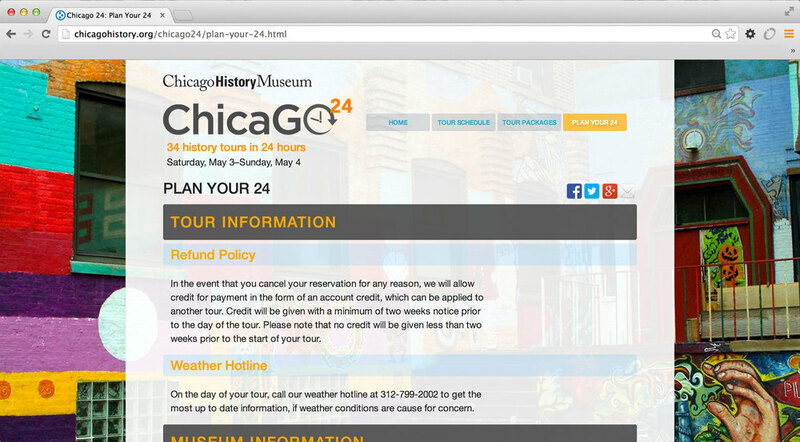 We missed the mark in effectively using Chicago 24 as a vehicle to promote our regularly scheduled tours year-round. The message was not clear from the beginning that this event was merely a sample of the tours we do throughout the year, and not just a one-time thing -- we received multiple requests to do these Chicago 24 tours on other dates. We sought to create a powerful branded microsite that would both market the event in a visually appealing way, and overcome the limitations of the main museum website, but we could not rectify every limitation. The ticketing system is outdated and not user-friendly as evidenced by our usability tests. We could refine the microsite to create the best experience possible for our users, but without replacing or completely redesigning the ticketing system (which is a much larger, long-term project), we were unable to eliminate every obstacle in the purchasing process. Ultimately, the microsite provided users with easy access to event information so they could quickly make a purchasing decision, but once in the ticketing system, the act of purchasing was not always easy. Only about 55% of tickets sold were purchased via the website. The remaining percentage was purchased by phone or walkup. Based on a follow-up survey, we received some complaints about not having a working print-at-home option tickets. The effect of the ticketing system's problems has since opened up a larger conversation of undergoing a complete website and purchase system redesign.